Age-related macular degeneration (AMD) is associated with both dry and wet forms of the disease. Recent studies have emphasized the importance of clinical examination and optical coherence tomography (OCT) in assessing and following these patients.1 Fluorescein angiography (FA), however, continues to play a critical role in select cases. Here we review clinical settings where FA plays an important role in managing our patients. Dry AMD is associated with drusen, geographic atrophy, and retinal pigment epithelial (RPE) changes that are often detectable on clinical examination alone. 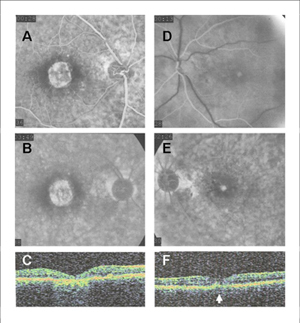 When vision loss is out of proportion to the clinical findings, FA may reveal more extensive atrophy (Figure 1A,B, early and late phases, respectively) or early CNV (Figure 1D,E) that may not be detected on OCT (Fig. C and F, respectively) or clinical examination alone and may explain the cause of vision loss. When screening patients for wet AMD, OCT may be very sensitive but not so specific.2 Wet AMD is often associated with retinal hemorrhage, exudates and macular edema – non-specific findings associated with a variety of other conditions.3 OCT can quantify macular edema but does not reveal the cause since the edema may be similar for such conditions as diabetic retinopathy, retinal vein occlusions, and CNV associated with AMD, myopia, and presumed ocular histoplasmosis syndrome. An FA may be critical to define the underlying cause or rule out an associated condition. Combination therapy using photodynamic therapy with an anti-VEGF agent and/or steroids is becoming a more popular way to manage patients with wet AMD.4,5 Fluorescein angiography is required for calculating lesion size when performing photodynamic therapy. In many cases the OCT provides useful information regarding the response to treatment and the activity of disease – a reduction in edema allows a quantitative measure of the response to treatment and the absence of edema suggests that the disease may be inactive. In some cases, however, the OCT may appear normal while the angiogram suggests significant activity (Fig. 1 D, E and F). These patients should be followed more closely and earlier retreatment is often required. An Amsler grid with patient instructions to return sooner for any change may not be adequate. In summary, FA remains an important part of our assessment of many patients with AMD. FA may reveal geographic atrophy and early CNV that may be missed with clinical examination and OCT. In patients with wet AMD, FA may rule out other conditions that may cause a similar clinical picture of hemorrhage, exudates and edema. In some patients, FA may also be useful in assessing response to treatment and activity of disease. Complications including macular ischemia, vascular occlusions, and RPE tears may also be detected more readily on FA than on clinical examination or OCT. The combination of clinical examination, OCT and appropriately timed FA is required to provide the best possible care for some patients. Reference(s): 1. Fung AE, Lalwani GA, Rosenfeld PJ, Dubovy SR, Michels S, Feuer WJ, Puliafito CA, Davis JL, Flynn HW Jr, Esquiabro M. An optical coherence tomography-guided, variable dosing regimen with intravitreal ranibizumab (Lucentis) for neovascular age-related macular degeneration.Am J Ophthalmol. 2007;143(4):566-83. 2. Talks J, Koshy Z, Chatzinikolas K. Use of optical coherence tomography, fluorescein angiography and indocyanine green angiography in a screening clinic for wet age-related macular degeneration. Br J Ophthalmol. 2007;91(5):600-1. 4. Augustin AJ, Puls S, Offermann I. Triple therapy for choroidal neovascularization due to age-related macular degeneration: verteporfin PDT, bevacizumab, and dexamethasone. Retina. 2007;27(2):133-40. 6. Shah CP, Hsu J, Garg SJ, Fischer DH, Kaiser R.Retinal pigment epithelial tear after intravitreal bevacizumab injection. Am J Ophthalmol. 2006;142(6):1070-2. Epub 2006 Sep 12.